Round three of the Isle of Man Open witnessed what was perhaps the biggest upset of not only the tournament, but the year. In the third round, former world champion, Vladimir Kramnik was playing on board 28 (which in itself is remarkable given that he is the second seed in the tournament) against veteran American Grand Master James Tarjan. There was every reason to put your money on Big Vlad in this match-up. After all, he is a former world champion, the second seed in the tournament and the third highest-ranked player in the world. His opponent, Tarjan, on the other hand, is a 65-year-old Grand Master rated around 400 points below Kramnik. Of course, Tarjan is a good player in his own right but expecting him to beat one of the legends of the game is way too far-fetched. With white pieces in hand, Tarjan went for the English opening. In response, Kramnik went for the c6-d5 structure and expanded in the centre with his pawns. As play progressed, the former world champion broke through the centre and tried generating an attack on Tarjan’s king. 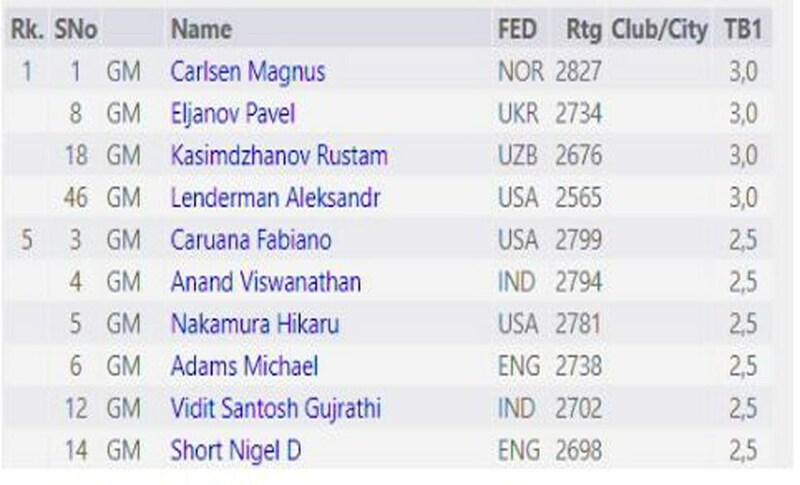 According to the computers, Kramnik had the better position by move 30. But just then something spectacular happened. 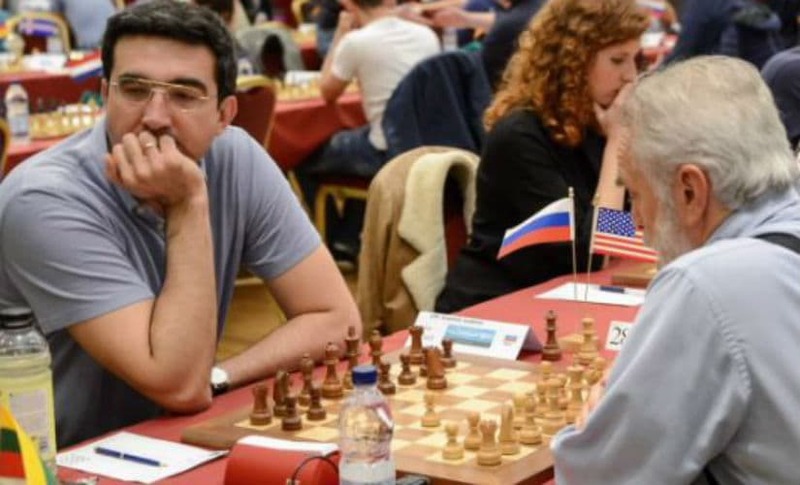 In an attempt to force things immediately, Kramnik went all out and tried penetrating into the white camp with his queen while collecting an exchange along the way. But this was simply overextension. The queen was now exposed to all kinds of traps. Had it not been for a bailout variation that led to a draw, he would have been in serious trouble. But Kramnik had his crazy hat on. Instead of going for a draw, he chose to continue with a position in which he had a rook and two pawns against Tarjan’s two bishops. Soon, there was a mass exchange of pieces after which the white bishops easily overpowered the black rook. By move 56, Tarjan’s queen-knight pawn was about to queen and Kramnik was forced to resign. On the top board, Magnus Carlsen played a magnificent attacking game to beat the American prodigy Jeffery Xiong. Kicking off with a Torre Attack-like structure, Carlsen went all guns blazing at the American teenager. After the latter castled on the kingside, Carlsen flung his pawns forward and ripped open the floodgates to the black king. The position was objectively equal according to the computers, but to the human eye, the attack looked monstrous. In fact, until the 31st move, Xiong’s position was well within the realms of defensibility. However, Xiong blundered at this point and the game ended within merely a couple of moves. After a draw against Jonas Lampert in the previous round, the 'Madras Tiger', Viswanathan Anand, came back with a roar. In the third round, he had the white pieces. 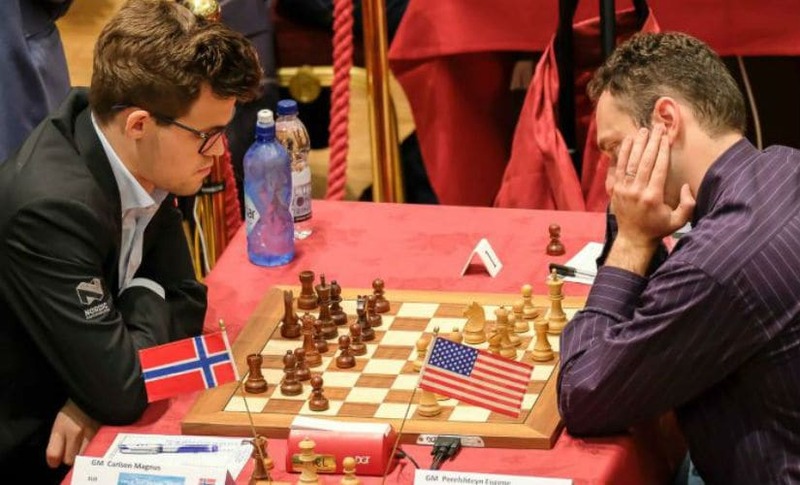 His opponent, Nikolas Lubbe, another German International Master with a 2,500-plus rating, essayed the Sicilian Najdorf. 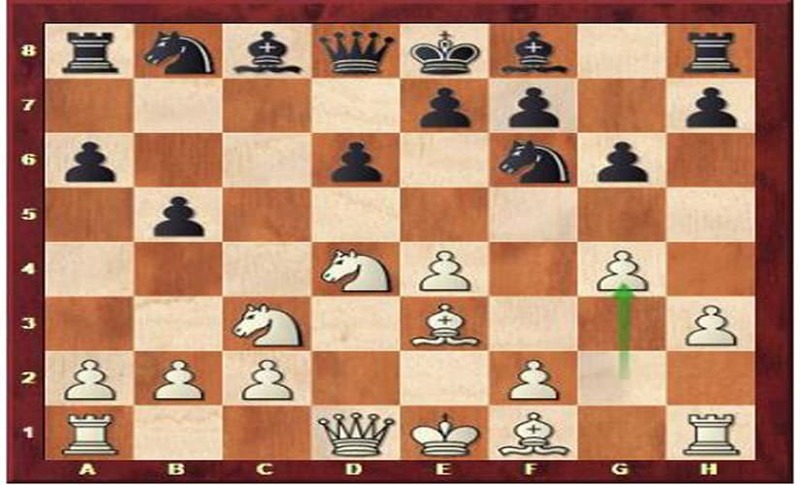 On the 18th move, Anand created an outpost for his knight on the b6 square. In return, his opponent got the d5 break, a move considered highly desirable for black in the Najdorf Sicilian. The position was still objectively equal though. As play progressed, Anand gave his queen up for two rooks and tried landing one of them on the seventh rank. It was around here that the German fumbled. On his 34th move, he brought his king to the f6 square which allowed the Indian an opportunity to weave mating nets. Perhaps, Lubbe was in time pressure at this point given that players were nearing the 40th move, or the first time control. Once the black king was out in the open, the Indian ace generated a strong attack on it with his rooks, bishop and pawns. By the 42nd move, Lubbe’s king was in dire straits. In order to avoid being checkmated, he would have had to sacrifice his queen. He decided to throw in the towel at this point. The game between Vidit Gujrathi and Michael Brown featured the delayed Steinitz Variation of the Ruy Lopez. 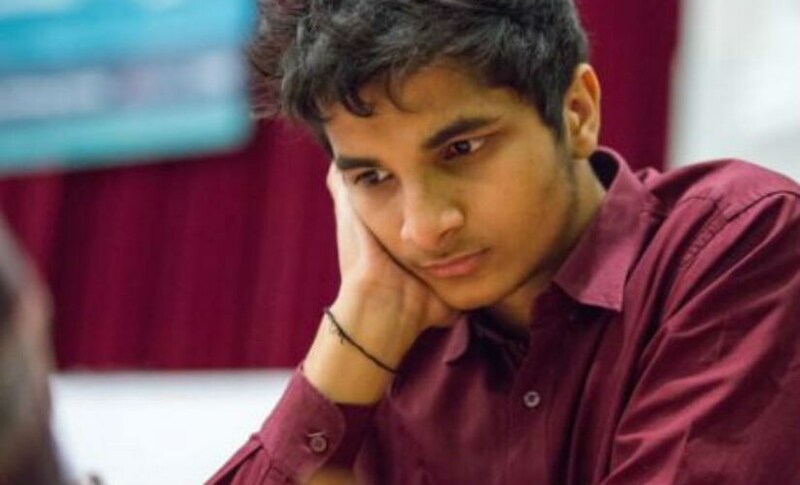 Although the Indian had good play throughout the game, he could never really boast of an advantage until the 35th move when his opponent faltered and allowed Gujrathi’s queen to penetrate into the black camp. This just spelt disaster for the American youngster as not only did Gujrathi break through on the queenside and win a pawn, he also was able to generate a strong attack on his opponent’s king with his knight and queen. With his position under tremendous pressure, Brown cracked once again and mistakes on the 41st and 42nd moves allowed Gujrathi to catch Brown’s king in a mating net. 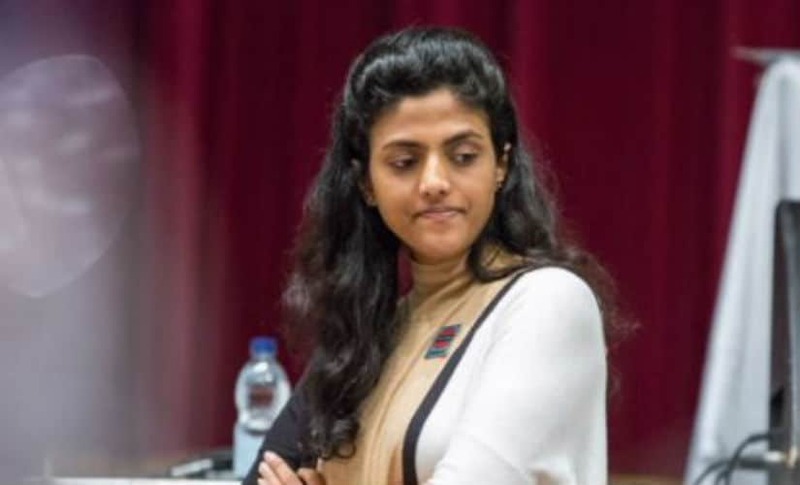 After two consecutive wins against lower-rated opponents, Harika Dronavalli faced Nils Grandelius, who is rated more than 100 points above her. With black pieces, the Swedish No 1 essayed the razor sharp but heavily theoretical Dragon variation of the Sicilian. The women’s World No 12 seemed to be well-prepared for this and came up with a novelty in the opening as early as move eight. In this position, Harika came up with the novelty 8.g4 (marked with the green arrow). Even though her novelty did not create too many winning chances for her, she did get a comfortable position to play. Almost immediately past the opening phase of the game, there was a mass exchange of pieces which led to a rook plus opposite coloured bishop endgame. On the 37th move, Dronavalli managed to win a pawn but this required her to exchange rooks. Given that the players were now left with bishops of opposite colour, there were high chances of them going into a theoretically drawn endgame. And that is what happened. Grandelius was able to firmly block Dronavalli’s extra pawn and restrict her from making any progress. Players, therefore, signed truce on the 45th move. 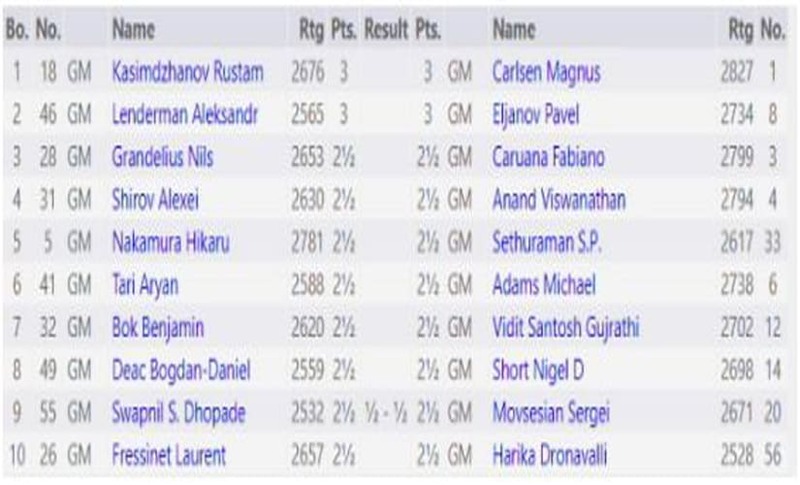 After three rounds, four players are leading with a perfect score, namely: Carlsen, Pavel Eljanov, Rustam Kasimdzhanov, and Alexander Lendermann. Five Indians – Anand, Gujrathi, SP Sethuraman, Swapnil Dhopade and Dronavalli – are half-a-point behind in a 19-way-tie for the second place. 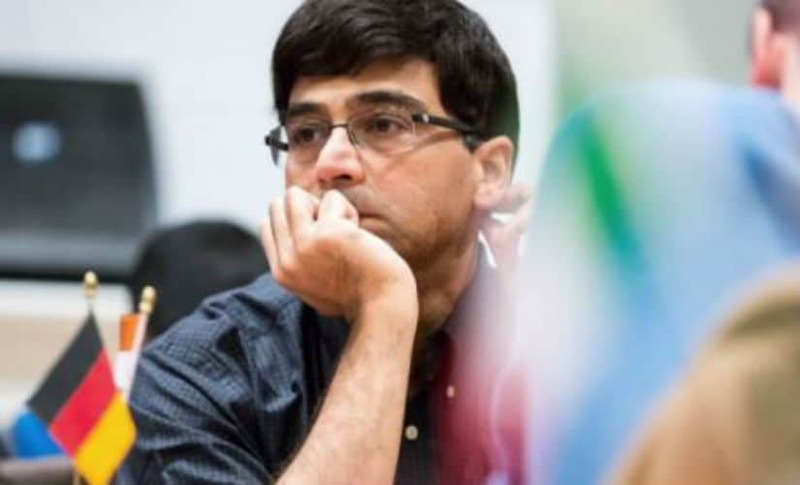 Some of the top Indian pairings for round four are: Anand vs Alexei Shirov; Hikaru Nakamura vs Sethuraman; Benjamin Bok vs Gujrathi; Dhopade vs Sergei Movsesian; and Laurent Fressinet vs Dronavalli.